Our expert cottage cheese ceiling removal in Anaheim Hills CA eliminates an eyesore and a health hazard from your property. Ever wonder what possessed anyone to include cottage cheese ceilings in their interior design plan? Well, for many years cottage cheese ceilings were fashionable due to their many practical benefits, such as muffling sound and making ceiling cracks and stains less noticeable. Unfortunately, many older cottage cheese ceilings contain asbestos, which was once popular for its insulating and fire-retardant properties. This means you can’t just scrape it off yourself. 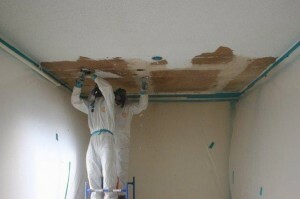 Instead, you must get professional cottage cheese ceiling removal in Anaheim Hills CA. When it comes to asbestos exposure, inhaling a little bit of dust every day for years or inhaling a large quantity of dust one time can both cause serious health problems. Naturally, you do not want to allow your cottage cheese ceiling to release any harmful asbestos fibers at all if you can help it. The good news is, you can protect your health and the quality of your indoor environment with AQHI Inc.’s professional cottage cheese ceiling removal in Anaheim Hills CA. If you need cottage cheese ceiling removal in Anaheim Hills CA, AQHI Inc. will do our best to accommodate you in a timely fashion. Please call us at 800-481-8080 to get started. Our asbestos removal office for Cottage Cheese Ceiling Removal in Anaheim Hills CA is open Monday through Friday between 8:00 AM and 5:00 PM and closed for lunch from noon to 1:00 PM. With advance notice, projects can be scheduled for weekends, early mornings and evenings.